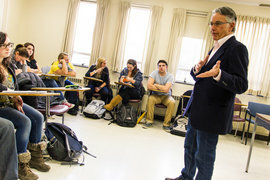 Professor Stewart Auyash leads class discussion. Enter Stewart Auyash, chair of the Department of Health Promotion and Physical Education at Ithaca College. His years of experience make him uniquely qualified to educate the next generation of health officials and communicators in the new public and community health major. Auyash says one of the strengths of Ithaca’s program is its compatibility with other disciplines. A veteran of teaching and working in public health, Auyash earned a master‘s degree in public health policy and management and a Ph.D. in speech communication and rhetoric. While developing a new child abuse examination program for the State Medical Examiner’s Office in North Carolina, he learned a vital lesson—that his job requires skill and knowledge in more than public health alone. He says his decision to earn a Ph.D. reflects the growing need for well-rounded programs. Interest in public health programs is growing nationwide, and Auyash considers Ithaca’s program to be a stepping-stone for students to use toward their personal and professional futures. “We think of this program as professionally oriented, intellectually driven, and skill based,” he says. Gregory Addicott ’14 has taken four classes with Auyash and says he has yet to be disappointed. “He’s always very thorough and provokes us to explore an issue in its entirety,” says, Addicott, who plans to continue his education in graduate school.